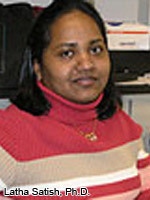 Regenerative Medicine Today welcomes Latha Satish, PhD. Dr. Satish is a Research Assistant Professor, Scarless Wound Healing Program at the Allegheny-Singer Research Institute. Her focus is on the biology of scarless wound healing, with specific interest on identifying novel genes that are responsible for scarless wound healing. As she describes, wound healing is a complex biological process that involves migration and proliferation of cells to repopulate the defect, synthesis of extracellular matrix proteins and remodeling of scar to re-establish the organ integrity. Further complicating this is that to regenerate functional skin, the dermal and epidermal layers should act in an orchestrated manner. How the major cells of each layer, fibroblasts in the dermis and keratinocytes in the epidermis coordinate their response is unknown. For more information about Dr. Satish, please click here.